Based loosely on Marie Brenner's Vanity Fair article "The Man Who Knew Too Much," "The Insider" tells several stories, the central of which is scientist Jeffrey Wigand's outing on "60 Minutes" of the tobacco industry's secret campaign to enhance the addictive potential of cigarettes. Stars Russell Crowe (probably his very best performance), Al Pacino, Christopher Plummer, and, in a small but unforgettable part, Bruce McGill. Please also feel free to discuss any of Michael Mann's films. To my eye, the first and last thirds of “The Insider” owe more in style to films like “The Conversation” than to Hitchcock: lots of conversation, some of it very heated, and quite a bit of handheld camera (thankfully not shaky-cam). However, Mann establishes a paranoid, claustrophobic tone from the very first frames on: the first thing we see is what appears to be fabric stretched over the lens. Only after several seconds does it become evident that the POV is Lowell Bergman’s as he travels as a helpless passenger, blindfolded, to speak to the head of Hezbollah. His journey into unknown and possibly lethal territory sets the stage for Jeffrey Wigand’s character arc in the film. Wigand, whom Crowe portrays from six feet behind the eyes as an insular, introverted man with a not-so-hidden pugilistic streak, proceeds in fits and starts toward his lonely destiny as the man who (might) tell too much, with no certainty that “everything will be OK”. After a rather talky first hour, the film begins its ascent into operatic heights when Liane Wigand, Jeffrey’s wife (played subtly and beautifully by Diane Venora), goes down to the basement to check the family’s email account. It is this incident where Wigand’s enemies truly show their hand for the first time - what Liane sees on the screen is pure evil. One critic used the word “opera” derisively; I use it here as a high compliment. Editing, score, acting, direction - all come together here for about 40 minutes in a way that for me makes the film one of the very few worthy successors to “Vertigo.” The climax of the film is Bruce McGill’s “aria” as Wigand’s attorney in a Mississippi state court. McGill has about five minutes of solo screen time and he embodies righteous rage in a way I’ve never seen on or off screen before or since. Roger Ebert wrote that this film affected him more than “All The President’s Men” because Watergate didn’t kill his parents - cigarettes did. (Sadly, tobacco probably played a role in Ebert’s own death.) I feel like “big” films of the last 20 years aren’t as well remembered as those from the sixties and seventies. I’m not sure why that is, but I’d like to do my part to ensure that they get the respect they deserve. From The Insider to Hackers to House of Cards, what I find interesting is that Hollywood still hasn't found a Hollywood-worthy way of depicting action that's occurring on a computer screen. It always looks amateurish, like a television show trying to depict an explosion that exceeds their budget for special effects. I don't know what the solution is, but after all these years—heck, 1971's Andromeda Strain did it as well as anything recent—I'm surprised smarter minds haven't found a solution. This film is one of the rare exceptions to my rule of avoiding based-on-true-events films. Normally I hate those. This one was great. 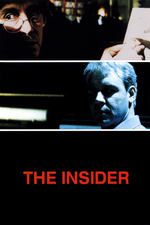 I think "The Insider" is some of Pacino's best work of his later career. He raises his voice here and there, but it never seems over the top. His righteous indignation in the scene when CBS suggests to him that they do an alternate cut of the story is perfect. He delivers angry monologues like nobody's business. And he and Russell Crowe do amazing work in their scenes together. Mann's last good film, Pacino's last good role, and the film that cemented Crowe in my mind as an actor worth watching. Hell, I even loved Noah, which apparently I'm not supposed to.